Cassette includes digital download card printed on plantable seed paper. Limited to 250 cassettes. Grand Garden's first release of 2015 is from Louisville, KY native Dr. Dundiff. 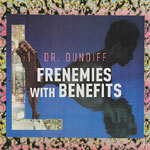 This is Dr. Dundiff's first solo physical release and features some of the most promising producers in the mix. Recently featured on the cover of Blackjaw magazine, sponsored by Native Clothing and laying down the mix for episode 23 of Beat Cinema, Dundiff has been a busy producer. We all have friends and enemies and sometimes in life we learn they can come with benefits. This tape takes us on a trip down the relationship rabbit hole. Very chill beats, sonic and Dilla-esque. Videos from Sick Kid Productions, artwork from JohnMoProductions, and mastered by LoFidel -- this is a bountiful harvest from Grand Garden.